When the feeling of getting caught in worldly affairs becomes foreboding, the only rescue left is in the embrace of God. 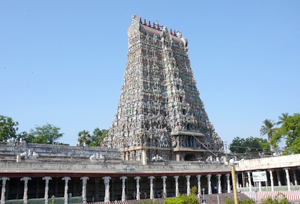 One such place is Meenakshi Amman Temple, affectionately referred to as 'Athens of the East'. Devotees have to reach to the southern bank of River Vaigai of Madurai city in Tamil Nadu state. 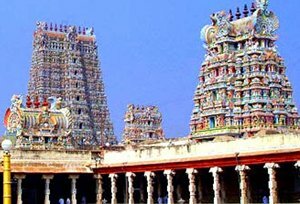 The popularity of the temple has made the city so well-known that people know it as 'Temple city' more than its name Madurai itself. Dedicated to Goddess Parvati, referred to as 'Meenakshi' and her husband Lord Shiva who is better known as 'Sundareswarar', the temple forms geographical and cultural centre of the city. Not to mention the rituals, worship and festivals associated with the temple that attracts people from all over the globe. The temple is believed to have come into existence when King of Devas - Indra found sacred 'Suyambu Lingam'- a form of Lord Shiva, discovered at Kadambavanam and enshrined at Madurai. However, the building now stands is a result of Sadayavarman Sundara Pandyan in 12th century followed by the extensions made by Nayaka rulers between 12th to 18th century. As far as legends go, they tell about Goddess Parvati taking birth in the home of King Malayadwaja Pandya and his wife Kanchanamalai as a reward of their 'Yagya'. She was born with a physical abnormality of having three breasts but 'Heavens' reassured the parents of vanishing of the third breast on soon as the girl will meet her husband. This eventually happened when trained in all war arts, she won over Vaikunth (abode of Vishnu), Amravati (abode of Celestial deities Devas) and Sathyalok (abode of Brahma), couldn't meet her eyes as soon as she saw Lord Shiva in his abode Kailasha. She realized her destiny with the Lord and came back to her home Madurai, where the couple was wedded in presence of the world. They are now the presiding deities of Meenakshi Temple. By Air: Madurai airport is located 12 km from the cities. The airport offers services to most of the cities in India as well as few international destinations like Sri Lanka & Kuala Lumpur. By Rail: Cities like Bangalore, Chennai, Mumbai, Delhi and many other connects directly to Madurai. By Road: All the cities of Tamil Nadu can take to Madurai, which another plus point of being popular. Madurai has three major bus terminals, namely, Mattuthavani Integrated Bus Terminus, Arappalayam and Periyar Bus stand. Interstate and Intrastate bus travel is not uncommon.